U.S. President Donald Trump (left) talks with South Korean President Moon Jae-In (right) during a joint press conference at the presidential Blue House in Seoul, South Korea, November 7, 2017. Trump is in South Korea as a part of a five-country tour of Asia. On November 3, Donald Trump embarked on a five-country tour of Asia where he’s visiting Japan, South Korea, China, Vietnam, and the Philippines. Orville Schell, Arthur Ross Director of the Center on U.S.-China Relations and ChinaFile’s publisher, is on the trip, on assignment for Vanity Fair. This piece is part of a series of daily posts in which Schell reflects on what he’s seeing on the trip. Slowly we are stitching our way across Asia on Donald J. Trump’s great five-nation oriental hegira. After a punishing 2:00 a.m. departure from Yokota Air Force Base outside Tokyo, we arrived this morning at Osan Air Base outside of Seoul, a reminder of the network of massive military bases the U.S. maintains in northeast Asia. Like Japan, the Republic of Korea is a treaty ally of the U.S. whose reliance on American military support has suddenly come back to the fore as North Korea rattles its new arsenal of nuclear weapons and ICBMs, unsettling the entire Pacific region, including the American West Coast, as cities as far east as Chicago become vulnerable to DPRK attack. POTUS was greeted at the Blue House by Korea’s new President Moon Jae-in, and then this evening they gave a joint press conference. As he mounted the dais and stood behind the podium while President Moon extolled their friendship and the U.S.-ROK alliance, he looked tired, red-faced, and puffy, but with jaw clenched and chin thrust out in his signature pose of defiance. It was sobering to reflect that he was the leader of the most powerful nation in the world, to whom global leaders still come to hold court. 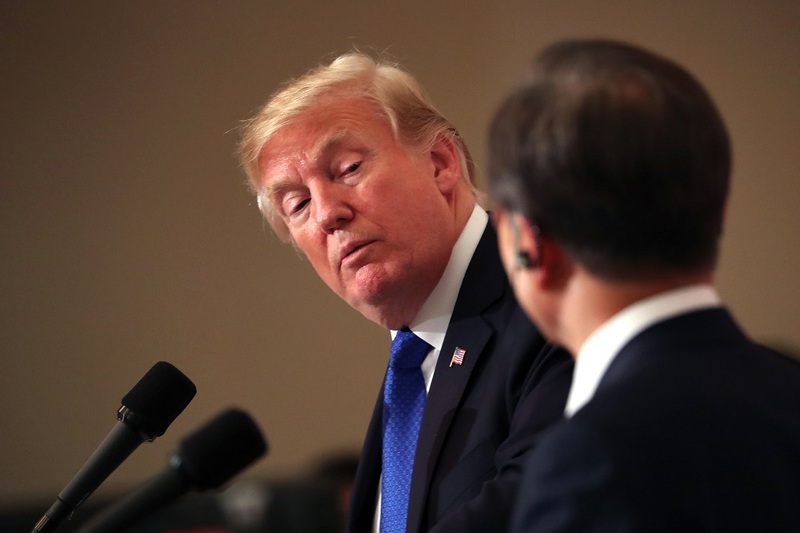 Each time I watch President Trump with an Asian leader reading out a statement, I cannot but help thinking that for him these pre-written statements are not only a learning experience, but the moment he internalizes what he is saying. It is the experience of reading out these prepared statements that seems to actually make him identify more closely with the country he is in and its leader. Some people might intellectually appreciate the virtue of an alliance or leadership relationship. Trump seems to only fully be able to embrace such connections by first playing the part of a supporter of such an alliance, by reading a script that someone else has written for him as an actor might read a script and internalize that character. Indeed, such statements and speeches may be a major portion of the very limited little reading he does. The declarations of allegiance seem to actually touch him. He seems to bond with the person beside him, and build a sense of loyalty that he perhaps has not felt before—when he was criticizing the country as freeloading off of American security largesse or a leader for being insufficiently hardline in their approach to a perceived enemy. It is as if the act of just mouthing words about the sanctity of an alliance or friendship with Abe or Moon helps catalyze his own sense of dedication to the connection. It becomes real for him, the word becomes flesh. Whatever the case, on this trip President Trump has stuck to the script handed him, done a reasonably good job, and seems to be coming away for our flight to Beijing tomorrow with a deeper conviction than ever of the importance of Japan and Korea to the U.S.’s Asian alliance against not only North Korea, but, in a far less explicit way, China. There is no doubt that as China becomes more nationalist, aggressive, and arrogant, these two Asian allies are also a bulwark against its outward reach. At tonight’s press conference at the elegant Blue House, Trump’s tone seemed a huge step down from his belligerent threat to rain down “fire and fury” on the DPRK. He even countenanced President Moon’s hope that pressure on Pyongyang might lead to peaceful negotiations, something he had once excoriated Secretary of State Tillerson for proposing. Who can fault the South Koreans for wanting to keep the hope that this stand-off can be peacefully avoided when the alternative is the 13,000 estimated artillery pieces situated just across the demilitarized zone and ready to obliterate Seoul? President Trump’s effusiveness about President Moon seemed to fall far short of the male bonding that he experienced with Japan’s Abe. But, if the U.S. and the ROK are united in a common goal of containing Pyongyang, there is another power-political-economic element that also joins them: both Seoul and Washington have very unresolved, and sometimes unstable, relationships with China. Of course, because they hardly have the economic clout or military power to oppose China, most South Koreans want to get along with Beijing. But the relationship is never easy. The bitter reality for Seoul is that Beijing views it as being something of a traditional “tribute state,” a lesser Confucian country that owes a certain cultural, economic, and even political deference to Beijing, whose new “son of heaven” is Party General Secretary Xi Jinping. And just recently, Xi reminded Korea of who’s boss by launching a series of punitive economic actions against South Korean businesses for having had the temerity to defend itself against the North by accepting a THAAD (Terminal High Altitude Area Defense) anti-missile system from the U.S. China’s leaders took umbrage because they thought its radars might get directed against them and that the move might also augur Seoul’s becoming even better integrated in the U.S. region-wide defensive systems that, while ostensibly aimed at Pyongyang, could also be used against China . . . should the need arise. So what did Beijing do? It launched a punitive economic campaign against select Korean businesses as a form of retaliation, upsetting a broad swath of Koreans who are dependent on their business relationship with China. They cut down the number of airline seats and Chinese tourists coming to Korea, hassled and boycotted companies operating in China like Hyundai and Lotte, even causing some factories and outlets to close down. Lotte was particularly hard hit, because it had the misfortune of having one of its golf courses expropriated for the THAAD anti-missile system. Koreans got a quick lesson on the limits of “friendship” when it comes to relying on China. China must have sensed that such bullying tactics also produce emotional blowback, and in anticipation of Trump’s arrival in Asia, Beijing suddenly worked out an agreement accepting the THAAD system and started making nice again by cancelling punitive measures against Korean businesses and tourism. While the residue left by such high-handedness remains, even though they may chafe at such retaliatory Chinese behavior, it is hard to see how Koreans can afford much of a public remonstration against it in the future. But here, they are hardly different than any other smaller Asian county that now survives at China’s sufferance.